Lord Krishna, who appears as Jagannatha at Puri, is believed to have directly played a role in the origin of the temple. Also in the unique wooden idol that is worshipped in the Puri Jagannath Temple. Puri is also known as Purushottamkshetra and archeologists date the present shrine at 1198 A.D.
King Indradyumna who ruled Puri, during the medieval age, had obtained all the worldly success and now he wanted to create something that would make his name immortal. Finally, the King decided to build a magnificent temple. But he was not sure to whom it should be dedicated. Soon Indradyumna had a dream in which he had a vision of blue image of Krishna or Madhava. He saw a finely carved statue of Jagannatha in a cave shrine on a hill but the king could not identify the place. King then sent out his forces to find the cave shrine. After a prolonged search, a soldier discovered the hidden cave shrine and the idol and it belonged to a devotee named Viswasu. The soldier found out that Viswasu will never part with the idol, so he stole it from the cave and gave it to the king. Viswasu’s devotion was unparalleled. Lord Krishna could not see the sad plight of his devotee and returned to the cave. Indradyumna was saddened and since he was a pious ruler and a true devotee, Lord Krishna agreed that the king will be presented with a unique idol provided that he completed the intended temple. The construction of the temple began in earnest and when it was completed, Krishna appeared before the king and asked him to go to the sea where he will find a log (wood) floating. The king did find the log but was unable to lift it, neither was his army capable of lifting it. Finally, Viswasu, the devotee of Krishna, hearing about the difficulty in lifting the log decided to try his luck and he was able to lift it like a feather. Once again proving that Jagannatha, the lord of the Universe, will reward his true devotee. The wood was ready but none of the artisans were ready to carve the unique image of Jagannatha. They did not know how to make use of the log. Finally, an old man appeared and agreed to carve the wood. 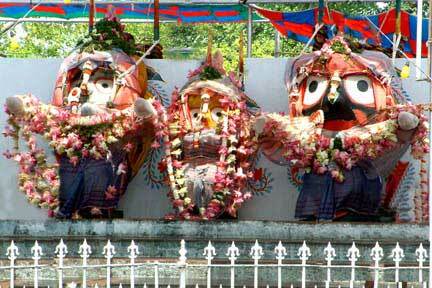 He will make three idols from the log that of Lord Jagannath, his brother Balaram and sister, Subhadra. But he has some conditions, he should be given three weeks and no one should see the images that he is carving before completion. Indradyumna agreed but his Queen was not impressed by the conditions. The old man started his work but the inquisitive queen was strictly following what was happening but did not have the courage to take a look in the workshop. One day during her routine checking, the queen did not hear any sound from the workshop and decided to take look. The moment she peeped into the workshop, the old man vanished into thin air. Later, the queen realized that the old man was Krishna himself and he had come to carve the unique idol for the King as promised. The King was happy with the unfinished idols and proceeded to install the idol at the new shrine. From that day onwards, Krishna is worshipped as Lord Jagannath at Puri.